The Gratz Gallery & Conservation Studio opened its doors in the summer of 2000 in New Hope, Pennsylvania, the birthplace of Pennsylvania Impressionism. Nine years later, the Gratz family moved its gallery and studio to Doylestown, just a block from the James A. Michener Art Museum and its world-class Pennsylvania Impressionism collection. In the fall of 2014, the gallery and studio moved to its current home, a pastoral, 10-acre farm on the outskirts of Doylestown. It’s a place that’s largely managed to conserve the bucolic, idyllically rustic beauty of Bucks County, right down to the gravel road out front that sees more ducks and ducklings on most spring and summer days than SUVs. 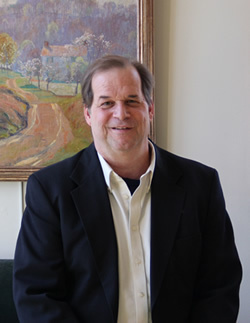 Paul Gratz, the owner and head conservator, has been buying, selling, and conserving paintings for more than 35 years. His formal training began at the Pennsylvania Academy of the Fine Arts. There, he studied under Louis B. Sloane, Joseph Amarotico, and Arthur DeCosta. Paul continued to hone his ability through apprenticeships with a number of the nation’s most revered conservators, including Gustav Berger, a recognized art conservation pioneer. Paul is an authority on work by the New Hope Circle of painters. Today, he leads a staff of skilled conservators at the Gratz Conservation Studio, which is housed next to the gallery and is open for private tours.